The Mad Max 4" Continuous Rim Cup Wheel provides a smooth, continuous rim for a clean, chip-free grinding of granite and marble edges. This Mad Max 6" Turbo Resin Cup Wheel is infused with resin compound and is designed for smoother grinding and shaping of marble and granite surfaces, corners, angles, and edges. Our Mad Max 4" Premium Turbo Cup Wheel provides a clean grind and smooth finish to stone and concrete. The Mad Max 6" Standard Turbo Cup Wheel features a turbo rim configuration for fast clean grinding and aggressive stock removal. 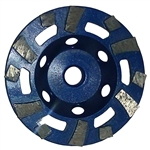 This Mad Max 7" Segment Double Row Cup Wheel employs a unique segment design for fast, clean grinding action and smooth finishes on rough stone. Diamax Cyclone S Resin Cup Wheels have the look and feel of a pad but have the performance and durability of a cup wheel. Sale price good through 4/30.